True comfort that’s comparable to home. 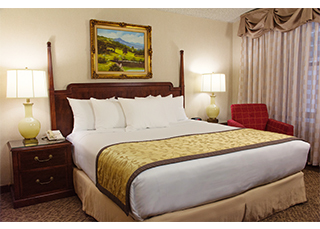 Each Deluxe King provides all the luxuries you’d expect from a hotel of this stature. Contemporary appointments found throughout include tasteful furnishings, granite tabletops, spacious bathrooms and a 32-inch LCD TV in each room. Adding to the convenience of this room is a mini-refrigerator, microwave and complimentary high-speed internet wi-fi with speeds up to 50Mbps. 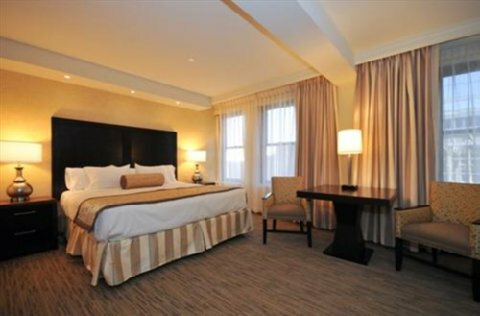 Sophistication beyond compare in our completely renovated Executive Room. Our room features a host of world-class amenities including elegant furnishings, granite tabletops, spacious bathrooms and a flat-screen LCD HDTV. Adding to the convenience of this room is a mini-refrigerator, microwave and complimentary high-speed internet wi-fi with speeds up to 50Mbps.